If you love our ribs, don't miss this treat! Tastes as sweet and tender as the meat off our ribs - without all the work! Fully cooked, warm and serve these marinated strips of bliss on rolls for a great casual meal. The pulled pork comes in 1.25 lb pouches. If you select the 5 lb option it will come in (4) 1.25 lb pouches. 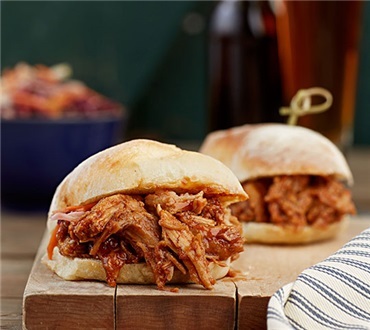 Pulled pork sliders are new and exciting and will be the hit of your next party or gathering. With our new slider rolls produced locally by Klingers Bakery and our tasty pulled pork it could not be easier to be a hero. Simply warm the fully cooked pulled pork and slice the slider rolls in half. Apply an approximately 2 oz. serving of tasty meat to each roll and they are good to go. Slider Roll Pulled Pork combo shipped with 30 rolls and 60 oz. of pulled pork (three 1.25 lb. containers). EXCELLENT pulled pork, just didn't purchase enough! I placed contents in bowl, added a bit of water, and microwaved until hot.I would recommend some "extra" sauce be included. The taste is outstanding!I served on toasted buns with a slice of onion, next time I will saute my onions for a different texture. Serve with coleslaw......so GOOD, will order again! Makes great sandwiches. Easy and fast to prepare. The pulled pork is excellent.